Patients with known bleeding issues, such as individuals who have suffered a bleeding stroke or spontaneous stomach bleeding. Adults 70 and older with no indications of heart disease. Younger individuals without family histories or signs of developing heart disease (including high blood pressure or elevated cholesterol) also should consult with their doctors because other steps may benefit them more than low-dose aspirin. These include a healthful program of weight control, exercise, not smoking, and monitoring and preventing problems with blood pressure, cholesterol, and diabetes. (This also may need to include sharp reductions in sugary or artificially sweetened drinks, which research, separately, associates with higher mortality risks when consumed more and more often). 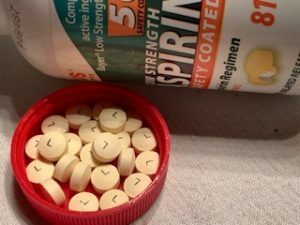 In the 1970s and 1980s, doctors and medical scientists began to find evidence that aspirin might be beneficial in preventing heart disease and cancers. Great attention was paid to the drug’s anti-inflammatory capacities. But decades of rigorous clinical trials and tough scrutiny of studies have increased skepticism about purported advantages of the ubiquitous drug, familiar since ancient times. The influential U.S. Preventive Services Task Force, a blue-ribbon group of medical scientists and experts who weigh in on behalf of the federal government about various therapies, gives a lukewarm B rating for low-dose aspirin to reduce heart disease and cancer risks in those ages 50 to 59, and a C rating for using the drug in adults even older. The panel, which hasn’t revisited the regimen since new studies have been published, had deemed the evidence inconclusive about low-dose aspirin for individuals younger than 50 and older than 70. Although patients may be disconcerted to see clinicians flip-flop on yet another therapy that had been promoted almost as gospel, the experts back-tracking on low-dose aspirin may be a good thing, and no surprise. On the one hand, it shows the medical community can be receptive to new rigorous science-based findings. On the other hand, it also shows how medical specialty groups and disease advocacy organizations too often talk get a bit ahead of the evidence. In my practice, I see not only the harms that patients suffer while seeking medical services, but also their struggles to access and afford safe, efficient, and excellent medical care. This challenge grows more daunting by the day as the costs, complexities, and uncertainties explode for therapies and especially for prescription medications, all too many of which prove to be dangerous drugs. A better way to fix heart valves? True to form, cardiologists at one of their major annual meetings—besides reversing their guidance on baby aspirin— also reported that studies show that tens of thousands of heart patients may not need to have their chests cracked open for replacements of faulty or flawed heart valves. This may be done, instead, with a minimally invasive procedure. It involves snaking a special, contracted replacement device through patients’ arteries, starting in the groin. The substitute valves, once monitoring machines show they are correctly positioned, can be opened like an umbrella. If more patients can skip the major ordeal of open-heart procedures, that could be good. For patients’ sake, let’s hope the FDA, already too gung-ho to clear medical devices for procedures and markets, looks skeptically not only today but in the future at TAVR and other surgical innovations. The FDA must, for example, ask if TAVR can be performed best and most safely only at large institutions or if smaller community hospitals can do enough of the operations so patients will be in skilled hands. The agency needs to step up retrospective reviews of medical devices and, yes, surgical procedures, to ensure patient safety. This is occurring, for example, with breast implants, problematic for a long time but supposedly modified to eliminate a barrage of patient complaints and lawsuits. Too many women can testify that not only with breast implants but also with minimally invasive surgeries — notably robot-assisted operations that the FDA has just warned should not include new cancer procedures for now — that doctors have been quick to experiment and “innovate” but slow to recognize their patients’ harms. These have included discomfort, pain, disfigurement, and deaths. Is it innovation or human experimentation? All treatments, whether heart valve surgeries or popping a baby aspirin every day, carry risks and benefits. Patients must learn about and understand them, especially from their medical caregivers. Doctors must protect their patients’ fundamental right for informed consent, meaning they are told clearly and fully all the important facts they need to make an intelligent decision about what treatment to have, where to get it, and from whom. This also means that doctors need to stay up to date, so they can inform their patients about the best options they have for optimal care. We appreciate progress and laud scientific gains … The medical conservative, however, recognizes that many developments promoted as medical advances offer, at best, marginal benefits. We do not ignore value … The medical conservative adopts new therapies when the benefit is clear and the evidence strong and unbiased … Most medical decisions, however, come with far less certainty. The BMJ clinical evidence team reviewed 3,000 treatments used in the UK’s National Health Service and found that about one half were of unknown effectiveness and only 11 percent were clearly beneficial. The medical conservative knows that even when clinical studies show that a drug, device or surgery reach a statistical threshold, the actual benefit derived by an individual can be far less than what is advertised or publicized. We resist the urge to conflate benefits of a therapy to a population vs benefit to the individual … The question we ask is simple: Would an unbiased patient, who had perfect knowledge of an intervention’s trade-offs, voluntarily choose to adopt it, and taking into account differing patient resources, pay for it? This desire for better decision quality drives the medical conservative to care about the growing commercialization of medicine. When money is at stake, the risk of hype increases. Not only does hype propagate low-value care, but it also erodes the public’s trust in medical science. Medical conservatives vigorously oppose hype in all its forms … We recognize that our knowledge and best models only rarely predict the success of a new intervention. We see true medical progress as slow and hard in large part because nature has provided the human body inherent healing properties. The wisest of conservative physicians understand and embrace how little effect the clinician has on outcomes. While many may call this frame of reference nihilistic, the conservative clinician sees it as protective against our greatest foe—hubris. Yes, in and out of medicine, hubris again emerges as our greatest. foe.